“We see Augmented Reality (AR) as a spectrum with pure reality at one end and wholly Virtual Reality (VR) at the other end. 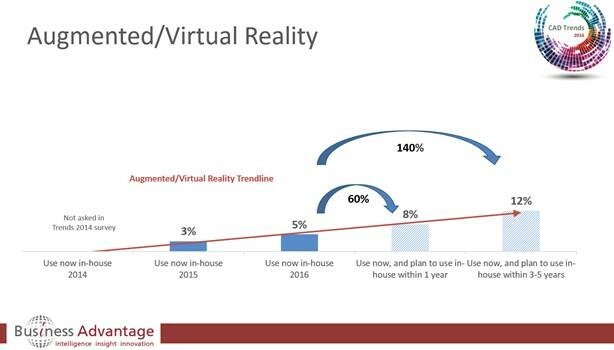 Currently for CAD users, managers and executives this trend has low current usage & importance, but very strong future growth potential is predicted by survey respondents,” – Chris Turner, CEO of Business Advantage Group. The survey results are based on responses from CAD users, Designers, Engineers and Professionals including managers and senior executives. Watch this blog for regular updates with more detail on other CAD trends from the 2016 Worldwide CAD Trends Survey. Naturally the report is a high level summary of insights gained from the data gathered and this series of blog posts enables us to add further detail but if you are interested in still more detail, such as information on CAD Augmented and Virtual Reality usage or growth predictions by region or industry, give us a call to chat with a research executive about your needs. Watch the CAD Trends 2016 webinar and other recorded webinars here.